Large sedan owners should take notice. The 2017 Kia Cazenda Limited. Mercury Grand Marquis and Ford Crown Victoria owners take note: your replacement vehicle is the Kia Cadenza, a large sedan with all the amenities (and then some) of your current pillow-soft cruiser. In fact, a soft ride is about all these three models have in common — the Kia is thoroughly modern and comes with technologies that weren’t even available when the Mercury/Ford twins met their joint demise in 2011. The Kia Cadenza is in some ways a throwback to an era when sedans were large and plush. These days, car models are taking it on the chin as consumers snap up SUVs and pickup trucks. Still, even as the segment shrinks — large cars have especially fallen to the wayside — some manufacturers are staying put. Toyota, Chevrolet, Ford, and Buick are still in, while Hyundai recently made its exit. Dodge and Chrysler are also represented, although the Charger and 300 are traditional rear-wheel drive models. Kia and the others are front-wheel drive (Buick and Ford also offer all-wheel drive). 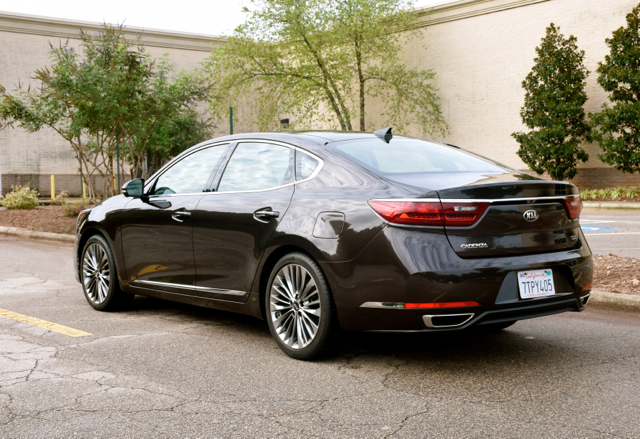 Just three years after its US debut, the 2017 Kia Cadenza has entered its second generation. 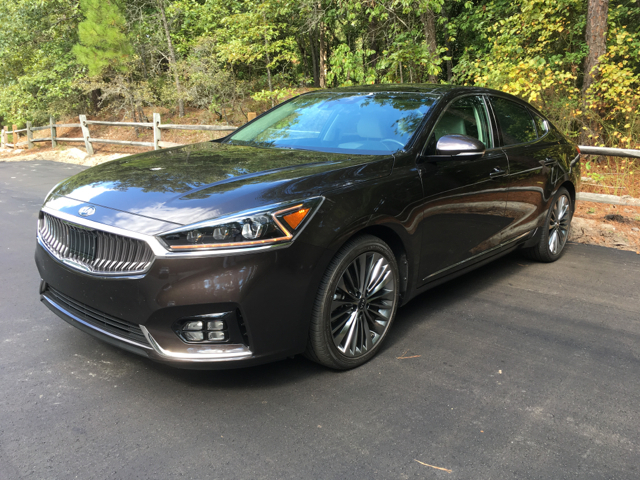 Although we’re in a transition between model years, a 2017 Cadenza model was the subject of my test drive. 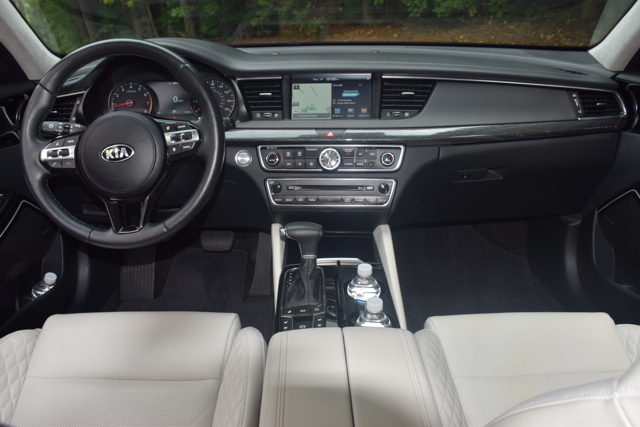 Kia offers the 2017 Cadenza in three trims: Premium ($31,990), Technology ($38,990) and Limited ($44,390). Add $900 for the destination fee. My test model was the fully loaded 2017 Cadenza Limited. It isn’t the most expensive Kia sedan you can buy — that honor belongs to the K900, a traditional rear-wheel drive model with a starting price of $50,000 and topping out at about $70,000. 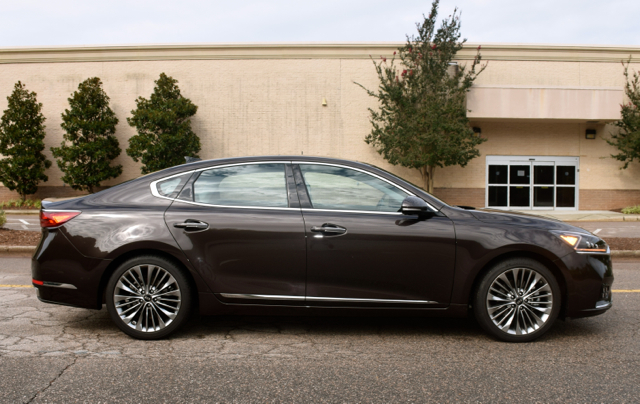 Owners of the defunct Lincoln Town Car and Cadillac DTS (Deville) are logical customers for this top-of-the-range Kia. All 2017 Cadenza models come with a V6 engine paired with an automatic transmission. I found myself gradually scanning the surface of the 2017 Cadenza to take it all in. The look is familiar, but updated — designer Peter Schreyer’s imprint is all over this model as it is on every other Kia (and Hyundai) vehicle. Up front, you’ll find the latest take on Kia’s tiger nose grille — a concave display that seems even more elegant than before. But the real attraction (at least in my opinion) are the oversized headlamps with the zig-zag LED accent lights on the Limited edition. The headlamps are a three-jewel arrangement, but the lights are the eye candy. Additional jewel lights comprise the available fog lamps. From stem to stern, the 2017 Cadenza offers a look that’s a nice cross between Europe’s finest sedans, such as the BMW 5-Series and Audi A6, and more traditional models such as the Buick LaCrosse and Lexus ES. This means you’ll find a high beltline, flowing roofline, large wheel arches along with the expected character lines and body sculpting. From the rear, you’ll find a raised deck, a decklid spoiler, wraparound tail lamps, available rear fog lamps, and dual exhaust ports. 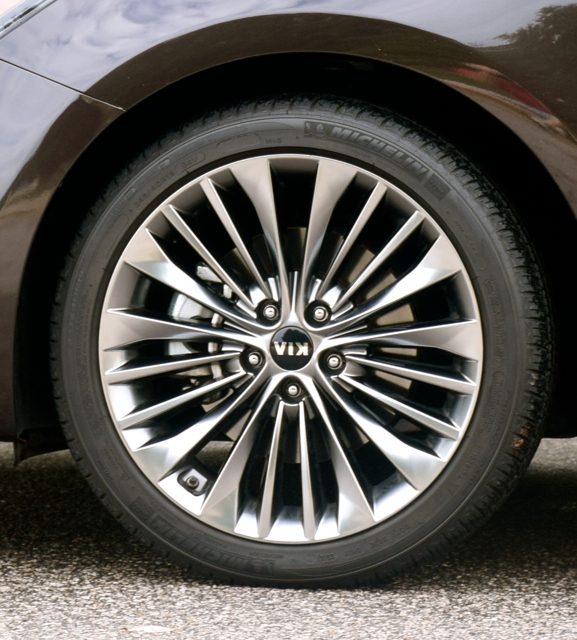 All models wear alloy wheels — 18-inch wheels are standard; 19-inch wheels, including a design dressed in dark satin finish are options. Other features include heated power-operated side mirrors with LED turn signal indicators and a power trunk. Automatic high beam assist, LED headlights, adaptive lights, and a panoramic sunroof with a power sunshade are additional available features. 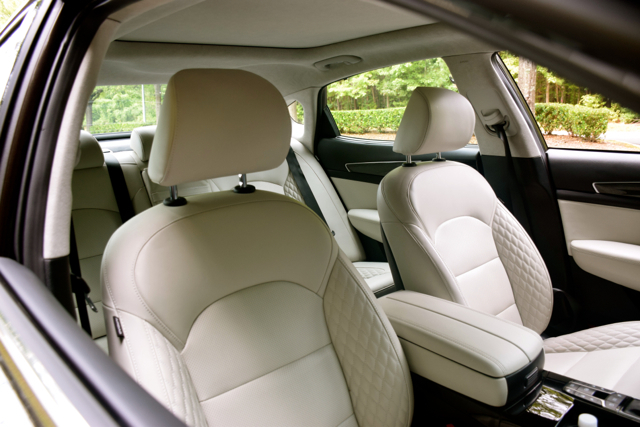 Let’s hear it for sedans that seat five in comfort! That’s exactly what the 2017 Cadenza provides, although if you do happen to sit in the rear, the seats are best enjoyed by those occupying the outboard position — they’re also heated in the Limited edition. Manufacturers typically provide journalists with top-trim models, but not always. In this case, Kia went for the jugular, likely to convince media folk that they mean business. I got the message. 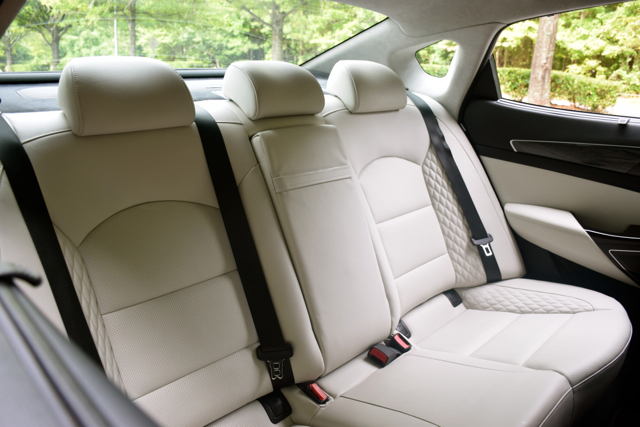 Everything about the Cadenza’s interior is top notch — from its layout to the quality of materials used. Leather seats come standard; Nappa quilted leather seats dress the Limited. Leather also wraps the steering wheel and gear shift knob. Beyond that, you’ll find soft touch materials and wood grain style trim. Perhaps not on the level of Mercedes-Benz, but certainly better than the Ford Taurus or the Dodge Charger. Standard equipment includes keyless entry with push-button start, power windows and door locks, a tilt and telescopic steering column (power operated, except in the base model), dual-zone climate control, LED map lamp, front foot lamp, an automatic dimming rear mirror, and a power trunk. Available features include a heated steering wheel, side rear window sunshades, a power rear sunshade, and a dual opening center console armrest. All these amenities were in my test model — I was especially impressed by the look and feel of the quilted leather. Overall, the seats were quite comfortable as was the ride. It isn’t the quietest cabin as some wind noise is noticeable, but barely so. The front ventilated seats worked as advertised — if it wasn’t 90 degrees outside I would have tried the heating element. The 2017 Cadenza garnered the Top Safety Pick+ award from the Insurance Institute for Highway Safety (IIHS), the Institute’s highest honor. All models come with a suite of airbags, including a driver’s knee airbag. Brake assist and hill start assist are among the standard safety features. Shoppers considering the base model may opt for a $3,000 Luxury Package, adding such driver-assist features as blind-spot detection, rear cross-traffic alert, and rear parking assist. Choose the Technology trim and you’ll get the driver-assist features of the Luxury Package along with adaptive cruise control, autonomous emergency braking, lane departure warning, and forward collision warning. The standard rearview monitor gives way to a surround view monitor and head’s up display in the Limited edition. We already covered the driver-assist technologies in the previous section. As far as in-cabin technologies go, the 2017 Cadenza has what you need or at least offers everything you could possibly want. The base model has a 7-inch touchscreen color display, what becomes an 8-inch screen with navigation elsewhere. Kia’s UVO infotainment system includes both Apple CarPlay and Android Auto smartphone integration. You’ll also find an 8-speaker audio system, HD Radio, satellite radio, Bluetooth connectivity, two USB ports, and an auxiliary audio input. Move away from the base model and you’ll also find smartphone wireless charging and a 630-watt, 12-speaker Harman Kardon audio system. So, what happens when you have just one powertrain choice? You go with it. The 2017 Cadenza has a 3.3-liter V6 engine, generating 290 horsepower and 253 pound-feet of torque, paired with an 8-speed automatic transmission. The two additional transmission gears give this model a net 1 mpg gain in fuel economy, now carrying an EPA-estimated 20 mpg in the city and 28 mpg on the highway. After spending one week with the Cadenza, not once did I feel it needed anything else under the hood. Although I like forced induction, I prefer a naturally-aspirated engine where it makes sense as it does in this sedan. Its 290 horsepower rating is better than some larger engines, making it one of the most power-dense engines on the market. Step on the accelerator and the Cadenza moves forward with authority. Floor it and there is no lack of power evident. Steering is sufficiently weighted and torque steer was non-existent. The ride is soft — perhaps a nod to traditional sedan folks. I can’t say the Cadenza is a joy to drive — it is closer to the Chevrolet Impala and Toyota Avalon in that department. If fun-to-drive is on your wish list, just hold out a bit longer as the all-new 2018 Kia Stinger will soon arrive, a rear-wheel drive model approximating the midsize Kia Optima’s size. As much as I hated to see the Kia Cadenza leave, it left behind a lasting and very positive impression with me. 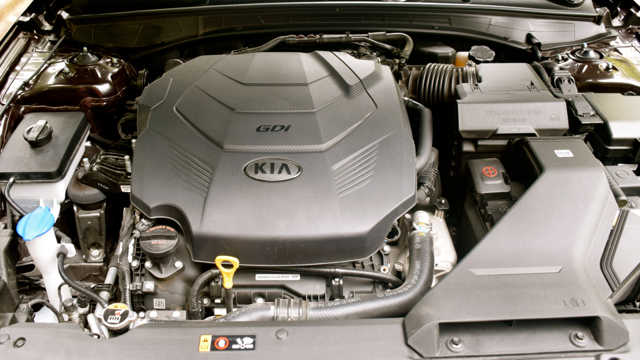 If you’re still trying to figure today’s Kia out, you’re not alone. After all, the automaker offers a host of small, mainstream models such as the Rio, a Sedona minivan, and soon a hot rear-wheel drive luxury sedan in the Stinger. As for the Cadenza, the Technology model offers the best bang for the buck, although that means doing without the lovely quilted seats (and the zig-zag lighting element). Its $40,000 price tag puts it right in the middle ground of such models as the Buick LaCrosse, but it costs about $3,000 more than the Chevrolet Impala. And though you cannot have the available all-wheel drive found in the LaCrosse, you receive a much more premium package than what the Chevrolet offers.